Iraqi citizens and soldiers inspect the scene of one of two car bombs that exploded in Basra, on May 20, 2013. 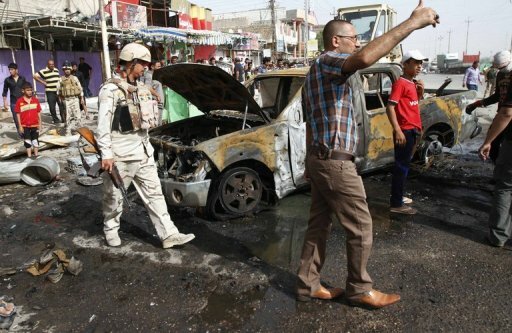 SAMARRA, Iraq — A car bomb exploded near a bus carrying Iranian pilgrims north of Baghdad on Monday, killing eight people, Iraqi police and a local official said. The explosion also wounded at least 15 people, they said. The pilgrims were on their way to a Shiite shrine in Samarra, which was bombed in February 2006, unleashing a wave of sectarian bloodletting in which tens of thousands of people died. Iraq is home to some of the holiest sites in Shiite Islam and is visited by hundreds of thousands of foreign pilgrims per year, most of them from neighbouring Iran. Sunni militants in Iraq, including those linked to Al-Qaeda, launch frequent attacks targeting Shiites whom they regard as apostates.